Never Enough Nails: Lynnderella Friday, Vol. 51!! Happy Friday everybody! 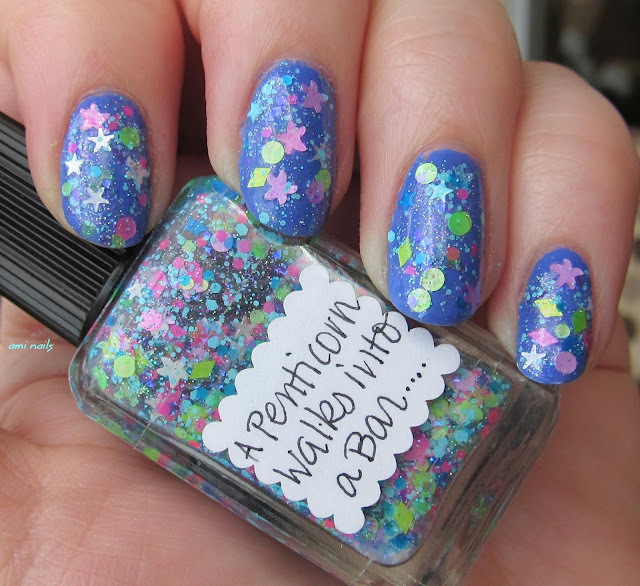 This Lynnderella Friday I have some pretty polishes for you, like Lynnderella Cerisiously. Cerisiously is a dark cherry shimmer with magenta/pink tones. 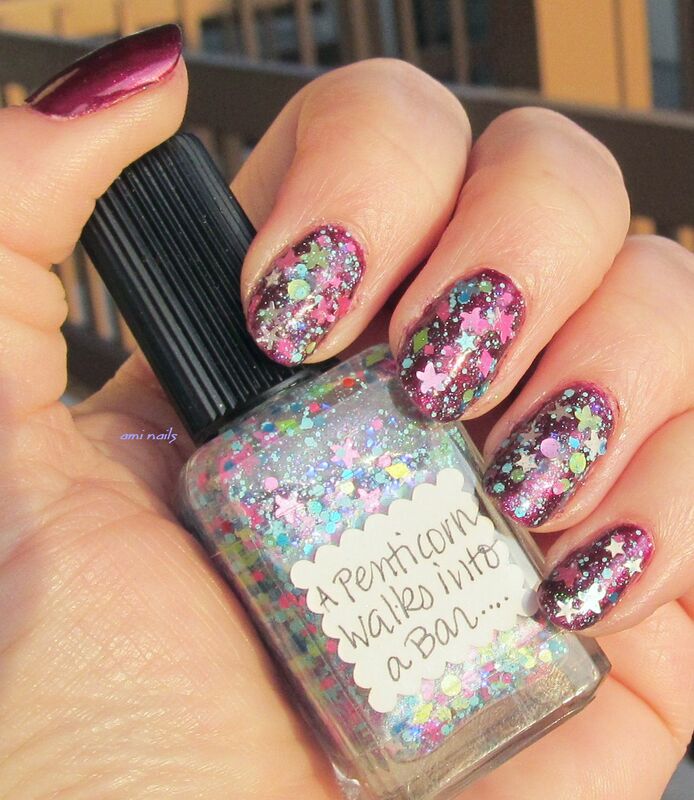 It has little silver holographic flecks that add a nice pop of holo to the vampy shimmer. The shimmer is really beautiful and complex looking, nice and smooth but with a lot of dimension. This is two coats and the formula was excellent. Nice and buttery to apply. Below I think you can see some of the holo micro flecks a bit better, they were hard to capture. Next up we have the new Castles for Starfish duo from Lynnderella! I received half of the duo to swatch and I did purchase the other half, but it won't arrive for a few days. 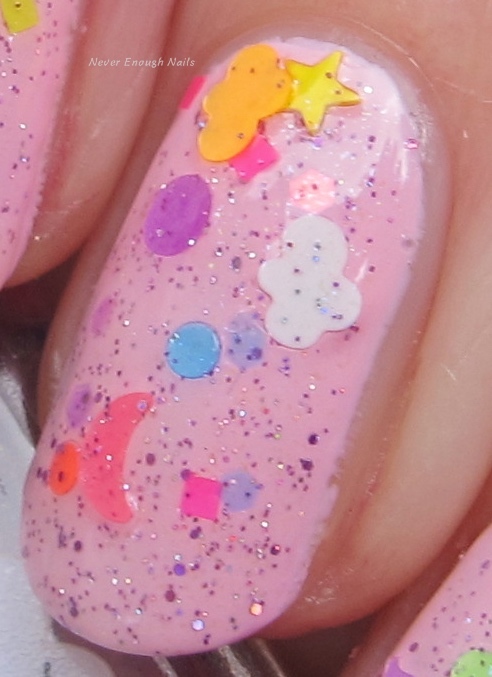 A fellow Lynnderella fan was nice enough to let me show you her swatches of that half, we'll get to that in a moment. Lynnderella Ice Cream Castles is described as a "neon multiglitter that features clouds, moons, dots and stars with fire opal iridescent glitter and holographic microglitter accents". It has a great selection of bright glitter in lots of my favorite shapes, so I'm in love! Look at that hot pink moon below! 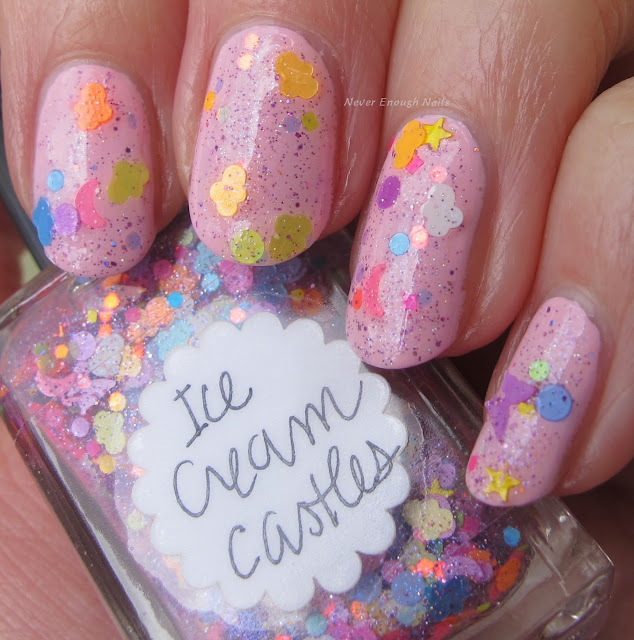 This is one dabbed coat of Ice Cream Castles over OPI Mod About You. It was easy to dab on, despite the plentiful glitters. The formula is a great consistency and that helps with the ease of application. 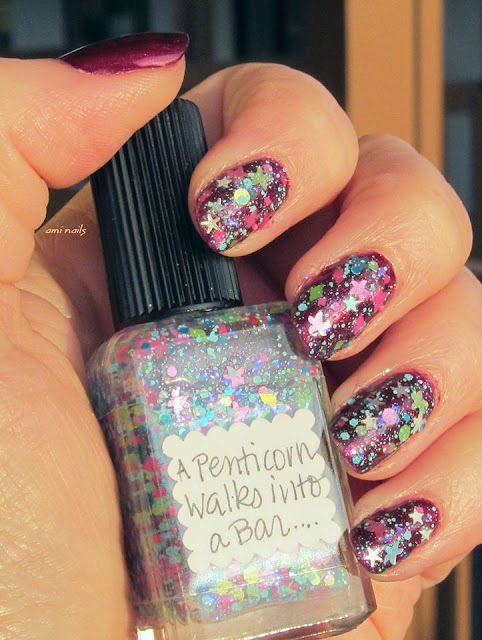 The other half of this awesome duo is Lynnderella A Penticorn Walks into a Bar. The name refers to an older Lynnderella polish that was one of the first ones she did with neon glitter- A Unicorn Walks into a Bar. It also jokingly refers to the starfish glitters in the polish. 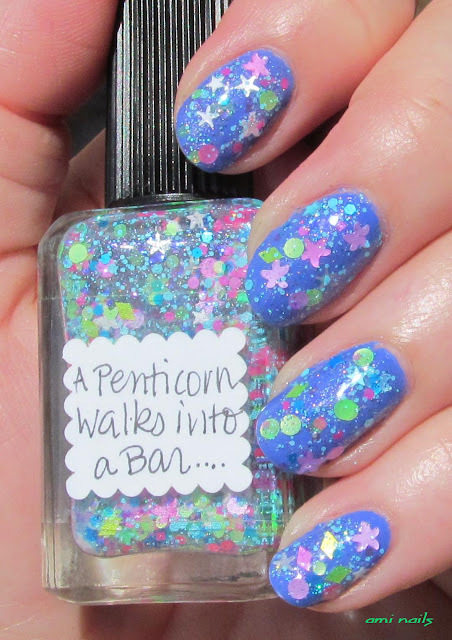 Some of them are pointier than others, so Lynnderella calls them "penticorns". 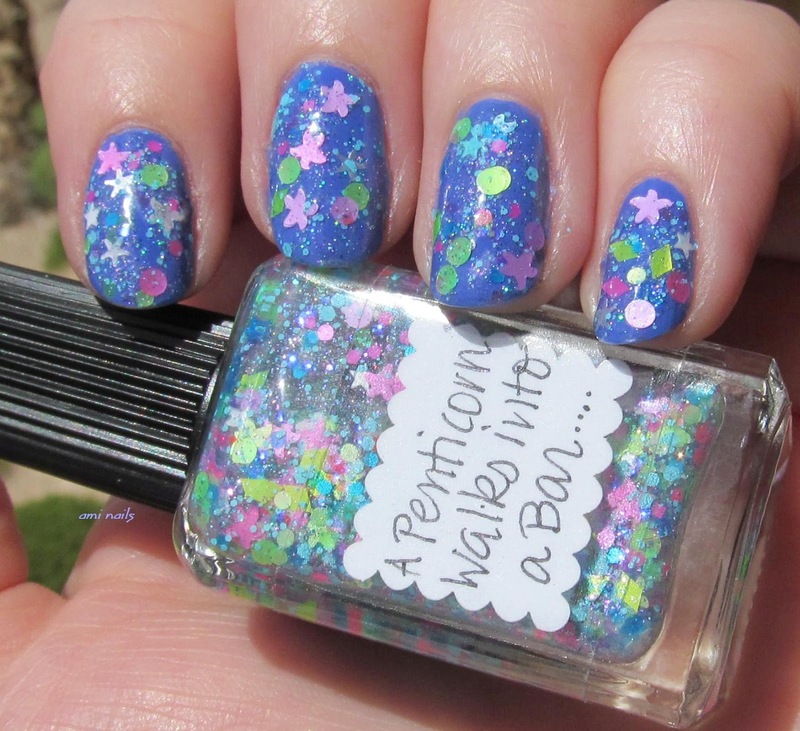 This polish is "made with assorted neon glitters and features regular and renegade pointy starfish, sand dollars and assorted diatoms. Accented with blazing blue iridescent glitters and holographic microglitter". 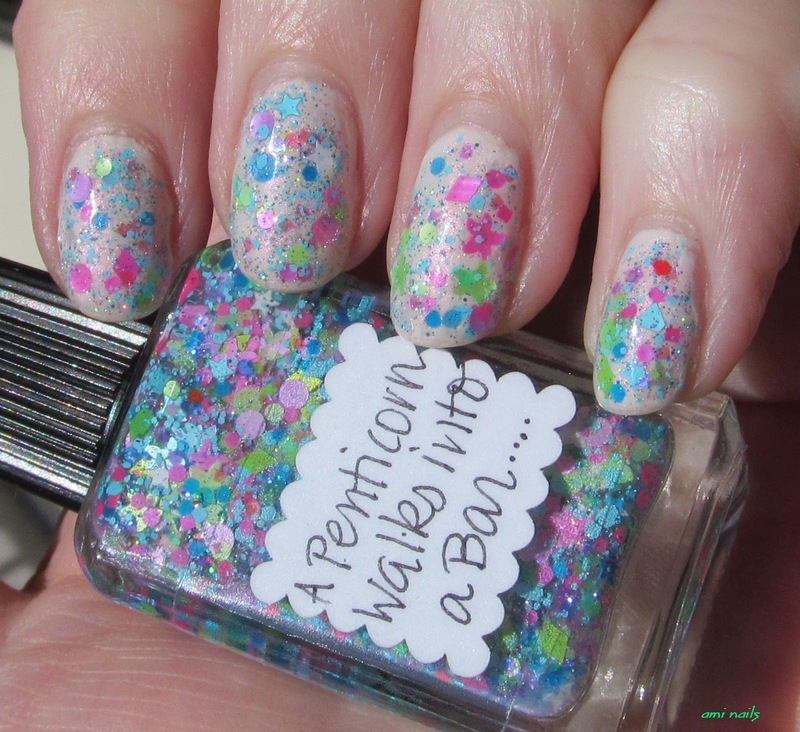 These swatches of A Penticorn Walks into a Bar are courtesy of the wonderful Amy of AmiNails, who was a guest swatcher for Lynnderella this week. Please check out her Pinterest board for more beautiful swatches! Thanks Amy! Amy swatched this beauty with a few different base colors. This blue Cirque Rehab. The white, orange and dark cherry bases below are RBL Ethereal, Zoya Thandie and Zoya Rihanna respectively. Cerisiously is available now at http://stores.ebay.com/lynnderella-lynnderella and the duo is available now at lynnderella.com!